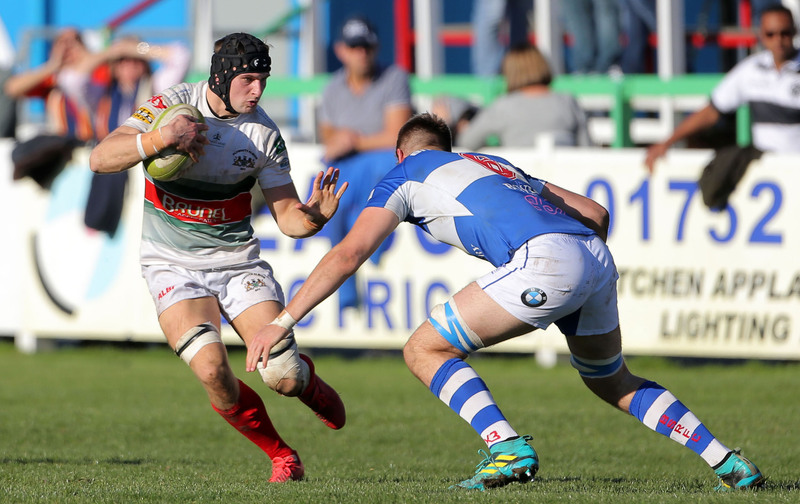 Plymouth Albion used a late show of power to escape the Brickfields with a close win Saturday, keeping Bishop’s Stortford at arm’s length to pull through 23-19. The game was a grim affair, full of poor discipline and errors from both sides who each racked up 14 penalties through 80 minutes. “Obviously I’m happy to get the win, we always celebrate our wins, but I thought it was a poor standard of game in general from both sides. “Discipline is still an issue for us, especially when sides come at us and we get under some pressure, so that’s a long-term work on goal for us. “I think they got it spot on, we talked in terms of getting some momentum back into our season, we said let’s forget about bonus points, let’s just take our points when they’re there and make sure we build some momentum in the game. The first half was a low scoring affair that seemed to be anyone’s to win as the sides played fast running rugby but failed to stack up any points. With a less than immaculate month and a half of games leaving Albion with three wins and four losses in National League One, Saturdays matchup had a must win feel to it early, and Albion seemed confident, after all they’d already had the scalp of second placed Caldy in hand. Albion were first to score in the opening passage, getting themselves cosy with Bishop’s line with a pinning penalty kick. With another penalty advantage being used as a buffer, Dan Mugford poked through a kick which just bounced dead before Jack Arnott could put it down. Electing to take early points, Albion’s Matt Shepherd chipped home from close range to put his side up 3-0. Bishop’s tried to reply with energy of their own, but the side continued to handicap themselves with a slew of penalties early. With their second venture into Bishop’s 22, a penalty for offside gifted yet more points, as Shepherd took another easy shot for three to double scoring. An extended period of stoppage then occurred around the 20-minute mark, as Bishop’s lost prop Seb Brownhill to an apparent neck injury. As the training staff and ambulance crews carefully carried the player off, the two sides tried to stay loose over the 15-minute break. As play resumed, Bishop’s put through two quick penalties of their own to level the score, with Manu Vunipola putting points to his name. Shepherd got another attempt of his own at the other end, but pulled the ball left of target. The dead calm conditions were built for the kicking game, but still, it was surprising to see both sides so committed to the posts, as the ball flowed freely between both lines in great areas of the field, it seemed more logical to go for the bigger points haul at times. Tries did materialise though, and without the aid of the referee’s whistle, both sides traded blows in quick succession before the half. Bishop’s Mark Mccraith used pace to break through the moving Albion line to put the ball down, then five minutes later, Albion snuck the ball off the back of the ruck into the hands of Connor Eastgate, who was left untouched through the posts. Both tries were converted to leave the score level at 13 heading into the lockers. The kicking continued to be a priority for Albion on the other side, and Bishops ninth penalty provided the fuel for another three Shepherd points, as the number 15 slotted a long-ranged effort from close to half-way. Both teams began to ramp up the speed of play, using the dry ground to cut and weave, but at times attackers were perhaps a little over-eager. One such flash of promise saw Arnott take a pinpoint cross-field pass to leave the speedy wing open, but whilst his run came close to more points, a last-minute pass couldn’t be executed, leaving the ball to knock forward. The cascade of penalties refused to let up, and it was Albion who took the lead in conceded decisions, with undisciplined play hurting the city side. Another two Vunipola penalties swung the visitors tally ahead, but neither side looked deserving of the lead. As the game began to fade away, Albion’s forwards began to overpower Bishop’s pack, and the side looked to push that advantage, electing to scrum over kicking for the first time in the afternoon. Time slowly crept by, and before Albion knew it, the game was on the line. Scrumming from 10 metres out, Bishop’s struggled tremendously, spoiling play on three occasions, but the penalty try wasn’t awarded. Still, penalties continued to be given for Albion, but the poor ball handling stung badly, as two separate five metre lineouts were blown by the hosts to silly errors. The decision not to kick for the draw late must also be questioned, as an opportunity out front of the posts was passed up to go for the win. Fortunately, the referee kept rekindling the game, awarding a third penalty for the hosts who set up another line-out. This time, to the relief of Hallett, his side were able to string one last effort to the line, using that forward advantage to score seven with ease. If the final try hadn’t paid true, questions would have been asked about Albion’s reluctance to turn away from the kicking game, but the side will happily take the win back on the road next week.